Well done, Sister Equity! – Gut gemacht, Schwester Equity! A few weeks ago the French La Charte pour l’Égalité entre les Femmes et les Hommes dans le Secteur du Cinéma was signed (Vive la Nouvelle Révolution du Cinéma! ), the effects of which will hopefully become apparent in the near future. A few years ago British actors’ union Equity launched a Viewers‘ Petition for Equal Representation of Women in Film and Television Drama with the aim to abolish the 2:1 dominance of male over female roles on British television, and an even worse ratio for films, and also to fight the almost non-existent portrayal of the older woman. How did this petition come about and has it begun showing effects already? I am very happy to have been able to interview Equity’s Jean Rogers on these and many more questions. Jean Rogers is a British actress, born just outside London. 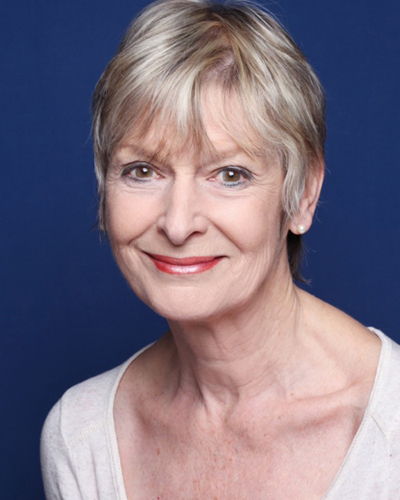 Her work in front of the camera includes THE PEACEMAKER, THE LAZARUS CHILD, more than 10 years as Dolly Skilbeck in ITV’s EMMERDALE and presenting a BBC TV Schools‘ programme for 7 year olds called WATCH. She has appeared regularly on British stages e.g. the Belgrade Theatre, Coventry, theYork Theatre Royal, two seasons with the Chichester Festival Theatre and was a founder member of Sir Laurence Olivier’s National Theatre. In radio she clocked up over a thousand broadcasts for the BBC playing boys and girls, POETRY CORNER and LISTEN WITH MOTHER. Her recent work was in SNOW WHITE playing the wicked queen in a Christmas pantomime. Jean has been an elected Councillor of the actors‘ and performers‘ union Equity for nearly twenty years and since 2004 Vice President. SchspIN: So Jean, tell me, how did the petition come about, who had the idea, and what obstacles had to be overcome? Did it all start in 2009? We had a Gender Agenda Conference in London and these results were discussed prior to publishing them in January 2009. We called upon members of our Unions for ideas and support. One of our members, Kate Buffery, suggested a petition to get public support and awareness on our side and to make broadcasters think. Our Equity steering committee looked at TV schedules and identified a 2 to1 bias in favour of actors and we based our petition on that. We have over 10,000 signatures and many many written views. It started as an initiative by female members of Equity? Yes, it was the women who campaigned. And were and are there male colleagues supporting it as well? Or were they uninterested, or even afraid of losing jobs? We had some outright opposition originally but mostly indifference, then annoyance. We persevered and as we refined and strengthened our arguments a number of enlightened men have spoken up for us which was refreshing. These are not great in number but they are there, and happy to say so, growing. What we do see is a determination from men that if we get nearer to a gender balance they will not let it swing against men! A growing number of men in theatre are starting to mentor young women but seem not interested in doing that for older women. Who signed the petition, mainly women? or even mainly actresses hoping for more work? was there support from audience organizations as well? The majority of signatories are undoubtedly women, many of whom are actresses, singers, dancers and musicians. However, there are significant number of actors, some of whom are household names who have signed as well as men and women from the general public. We got support from members of many other unions when attending TUC conferences and other gatherings. We stood outside the West End theatre playing CALENDAR GIRLS and many audience members and their husbands signed our forms. And have things begun to develop since then? We believe that because of our campaign of awareness there have been encouraging changes with some new series on Television, making women’s stories more central, and casting more women in the 40-50 age bracket. Still further to go though and we believe theatre has become worse, an area we thought was much better in 2009. How about reactions from other filmmakers? We have particularly worked with the Writers‘ Guild whose female writers also feel discriminated against when it comes to commissioning their plays. They cited a problem with commissioning editors being loathe to commission their work if it centred round an older woman’s story. Did you have to deal with the argument „Demands like these are censorship and restrict the freedom of art„? This is a common argument but I say it is all to do with choice. If you continually marginalise the roles of women then that is a type of censorship. Yes, artistic freedom is important but you must exercise it with responsibility and be aware of the choices you are making that can effect 51% of the population. It is not artistic to perpetuate stereotyping particularly of older women which is what we see a lot of in our industry. You mentioned some positive reactions as far as new TV productions are concerned. Congratulations! Could you name some of them? And are there also discussions going on about the sort of stories being told? There is a fantastic Northern writer called Sally Wainwright who has written SCOTT AND BAILEY for ITV which centres round two police officers in their 40’s. ITV also has a series called DOWNTON ABBEY which has an equal gender balance of characters ranging from a little scullery maid to a Dowager Duchess. Let’s look at the cast of DOWNTON ABBEY then, a series taking place at the country house of an aristocratic family in the early 20th century in Yorkshire, created and written by Julian Fellowes. The original run started on September 26, 2010. So far 4 seasons with a total of 34 episodes have been produced. Audience figures for the fourth series have hit an average 11.8 million viewers – making it the highest rated drama on television in 2013. 8 female and 3 male characters were cast in all 34 episodes so far. 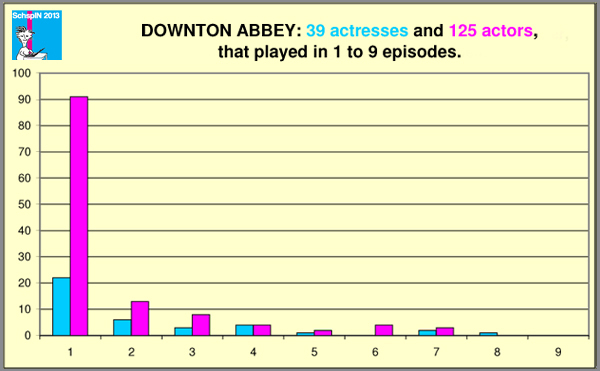 There is a larger number of males for the 1-episode parts, but overall there is a slight female majority (477 vs 463 as the sum of episodes for all characters). So Jean, apart from DOWNTON ABBEY, what else has happened? The BBC made a series CALL THE MIDWIFE set in the fifties with young midwives on bicycles and older nuns. Also, at present there is a very successful comedy series called LAST TANGO IN HALIFAX. The central characters are a man and woman who went out with each other in their teens and have met up again in their seventies and fallen in love again. It too is written by Sally Wainwright and took three years to be commissioned. The BBC turned it down on the grounds no- one would want to see old people in love, as did ITV. Eventually the BBC decided to risk it and they have a runaway success on their hands. The public love it! Great! What about the industry outside the UK? Do you know if your petition has been picked up in other countries, as a petition or at least as a reference point for discussimg their own situation? Yes Canada I believe although we have signatures from women worldwide. I was able to make references to the petition when giving evidence to the BBC’s Serving All Ages Report on TV, Radio and the Internet, and recently in evidence to Deputy Leader of the Labour Party, Harriet Harman’s Commission in Older Women in the Media and Public Life. It is one thing to talk about statistics, i.e. 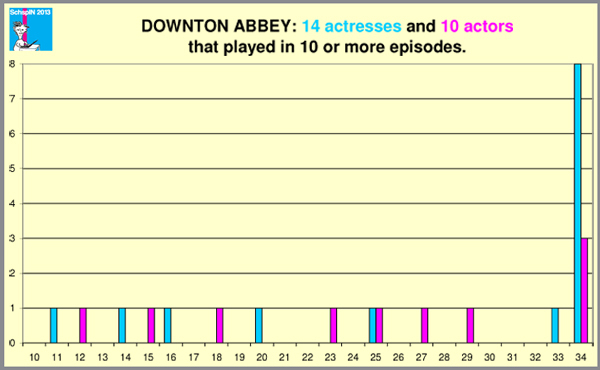 the number of female and male characters, and another to talk about the quality of the roles. Any thoughts on that, and the impact your petition might have? You have heard of the French Charter on Equality, which is quite groundbreaking of course, since it quite clearly also addresses the question of role quality and stereotypes as well as equal representation and equal pay. Would that be something to be copied in the UK, or even on a Europe-wide basis? Any plans from Equity and partner organizations in this direction? We have been talking along these lines at conferences and in articles for a number of years now and the quality of writing and roles is discussed in the second project of our FIA Steering group, a Handbook on Engendering Change. Last Question: In Germany we have neither a petition, nor a charter, just the 2:1 ration, the diminishing roles for older women, the gender stereotypes. Is there anything you can say to make us cheer up? I was talking to my son who works in the Human Rights section of the Council of Europe about the attitude to gender equality in Germany and he says you have a different attitude to it as though it is not a problem. Do you agree with that? I would say you have to do the monitoring and keep speaking about the results. Quote the UK, the USA, France, Scandinavia etc. I think one of the most difficult tasks is persuading women to see what is happening to them. Do that first, then you need to seek out sympathetic men! Thank you very much, Jean Rogers. Update: On Dec. 6 Sally Wainwright, the writer Jean mentioned in the interview, received the Technicolor Writing Award at the annual Women in Film and Television Awards in London. Gut gemacht, Schwester Equity! – Well done, Sister Equity! Vor ein paar Wochen wurde in Frankreich La Charte pour l’Égalité entre les Femmes et les Hommes dans le Secteur du Cinéma unterzeichnet (Vive la Nouvelle Révolution du Cinéma! ), deren Auswirkungen wir in nächster Zeit hoffentlich beobachten können. Vor ein paar Jahren brachte die britische Schauspielgewerkschaft Equity die Viewers‘ Petition for Equal Representation of Women in Film and Television Drama an den Start, mit dem erklärten Ziel, das 2:1-Übergewicht männlicher gegenüber weiblichen Rollen im britischen Fernsehen zu beenden (das Ungleichgewicht war im Kinosektor noch größer), und außerdem dem fast vollständigen Verschwinden älterer Frauenfiguren entgegenzuwirken. Wie kam es zu dieser Petition, und hat sie in den letzten vier Jahren bereits etwas bewirkt? Ich freue mich sehr, dass ich Jean Rogers von Equity zu diesem Thema interviewen durfte. Jean Rogers ist eine britische Schauspielerin, geboren vor den Toren Londons. Zu ihrer Filmarbeit gehört unter anderem THE PEACEMAKER, THE LAZARUS CHILD, mehr als 10 Jahre als Dolly Skilbeck in der Serie EMMERDALE (ITV) und die Moderation der BBC Schulsendung für 7-Jährige WATCH. Theaterengagements führten sie u.a. ans Belgrade Theatre, Coventry, das York Theatre Royal, das Chichester Festival Theatre and das Sir Laurence Olivier’s National Theatre, dessen Gründungsmitglied sie ist. Außerdem hat sie in über 1000 Radioproduktionen der BBC mitgespielt, u.a. in der POETRY CORNER und LISTEN WITH MOTHER. Zuletzt stand sie in einer Christmas Pantomime (das sind sehr aufwändig produzierte Weihnachtsmärchen) als böse Königin in SCHNEEWITTCHEN auf der Bühne. Jean ist seit 20 Jahren gewähltes Mitglied im Rat (Council) der Schauspielgewerkschaft Equity und seit 2004 auch Vizepräsidentin. SchspIN: Jean, wie ist es denn zu dieser Petition gekommen, wer hatte die Idee und welchen Hürden mussten genommen werden? Begann das Ganze 2009? Jean Rogers: Nein, schon viel früher. Als ich im Jahr 2004 Vizepräsidentin von Equity wurde, der Gewerkschaft für Schauspieler/innen, Inspizient/innen und Models, erfuhr ich vom Frauenausschauss, dass sie ziemlich unzufrieden waren mit der Darstellung von Frauen, insbesondere von Älteren, und damit, dass die Karrieren von Schaupielerinnen ab 40 im Gegensatz zu den von gleichalten Schauspielern deutlich rückläufig waren. Dies musste untersucht werden. 2008 wurde von Equity und einer Reihe weiterer Partner der EURO FIA (der Internationalen Föderation von Schauspieler/innen) eine EU-geförderte Studie in Auftrag gegeben, die die Zusammenhänge von Alter und Geschlecht und Berufstätigkeit von Darstellenden Künstler/innen in Europa zum Thema hatte. Laut Deborah Dean, der Leiterin dieser Untersuchung, berichteten europaweit Darstellende Künstlerinnen, egal ob in der Fernseh- oder Filmbranche, Rundfunk, Werbung oder am Theater tätig, dass sowohl ihr Geschlecht als auch das Älterwerden von Nachteil für ihre berufliche Laufbahn waren. Männer andererseits glaubten nicht, dass ihr Geschlecht sich nachteiligt auswirkte und die Angaben zum Alter waren gespalten, manche fanden es förderlich, andere hinderlich für ihre Karriere. Die Untersuchung ergab dass 26 % der Darstellenden Künstler Älterwerden als vorteilhaft in Bezug auf ihr Einkommen sahen, nur 3 % der Darstellenden Künstlerinnen teilten diese Sicht (Age, Gender and Performer Employment in Europe). Wir hatten eine Gender Agenda Konferenz in London wo diese Ergebnisse vor ihrer Veröffentlichung im Januar 2009 diskutiert wurden. Wir baten die Mitglieder unserer Gewerkschaft um Ideen und Unterstützung. Ein Mitglied, Kate Buffery, schlug eine Petition vor, um einerseits öffentliche Unterstützung und Aufmerksamkeit zu bekommen und andererseits um die Sender zum Nachdenken zu bringen. Das Präsidium von Equity untersuchte das Fernsehprogramm und machte das 2:1 Männerübergewicht in den Besetzungslisten, worauf wir dann unsere Petition gründeten. Es gibt bislang über 10.000 Unterschriften und eine sehr große Anzahl begleitender Kommentare. Das Ganze war eine Initiative von weiblichen Equity-Mitgliedern? Ja, die Frauen hatten diese Kampagne gestartet. Und gab es auch männliche Mitglieder, die die Idee unterstützten? Oder waren sie uninteressiert, oder hatten Angst, weniger Arbeit zu haben? Es gab anfangs offenen Widerstand aber hauptsächlich begegnete uns Gleichgültigkeit, und schließlich Verärgerung. Wir blieben dran, und als wir unsere Argumente weiter ausführten und verstärkten ergriffen einige aufgeklärte Männer für uns Partei und das war erfrischend. Es gibt nicht viele aber es gibt sie, und erfreulicherweise werden es auch mehr. Was wir aber auch feststellen ist eine Entschlossenheit bei Männern zu verhindern, dass die Entwicklung, sollte es zu einem Rollengleichgewicht kommen, nicht zu ihren Ungunsten weiter geht! Immer mehr Männer im Theaterbereich fördern junge Frauen, aber sind nicht besonders an einer Förderung älterer Frauen interessiert. Wer hat die Petition unterzeichnet, in erster Linie Frauen? Oder gar hauptsächlich Schauspielerinnen, die auf mehr Arbeit hoffen? Gab es auch Unterstützung von Publikumsorganisationen? Der Großteil der Unterschriften stammt zweifellos von Frauen, darunter viele Schauspielerinnen, Sängerinnen, Tänzerinnen und Musikerinnen. Allerdings gibt es auch eine nicht unerhebliche Anzahl von Schauspielern, die unterschrieben haben, darunter sehr viele bekannte, und ganz allgemein Männer und Frauen aus der Bevölkerung. Viele Mitglieder anderer Gewerkschaften haben uns unterstützt bei Gewerkschafts- und anderen Treffen. Wir standen vor dem West End Theater, in dem CALENDAR GIRLS aufgeführt wurde, und viele Frauen und ihre Männer aus dem Publkum haben direkt unterschrieben. Und was hat sich seitdem getan? Wir glauben, dass aufgrund unserer Aufklärungskampagne zu dieser Problematik vielversprechende Entwicklungen bei Fernsehserien stattgefunden haben, wo mehr Geschichten von Frauen im Fokus stehen und mehr Frauen zwischen 40 und 50 besetzt worden sind. Es ist aber noch ein weiter Weg, und wir haben außerdem den Eindruck, dass die Situation an den Theatern seit 2009 schlechter geworden ist. Wir haben besonders mit dem Drehbuchverband, der Writers’ Guild zusammengearbeitet, deren weibliche Mitglieder sich benachteiligt fühlen was die Auftragsvergabe betrifft. Sie benannten das Problem, dass Chefredakteur/innen Bücher nicht ausstehen können, die von älteren Frauen handeln. Hört Ihr auch das Argument „Solche Forderungen sind Zensur und schränken die Freiheit der Kunst ein“? Ja, das ist ein bekanntes Argument aber ich denke es ist eine Frage des Angebots. Wenn Frauenrollen regelmäßig an den Rand gedrängt werden ist das eine Form der Zensur. Natürlich ist künstlerische Freiheit wichtig, aber sie muss mit Verantwortung ausgeübt werden und mit dem Bewusstsein, dass die Entscheidungen in den Plots Aufwirkungen auf 51 % der Bevölkerung haben. Es ist nicht künstlerisch stereotype Geschlechterklischees aufrechtzuerhalten, besonders von älteren Frauen, und das ist etwas was wir in unserer Branche sehr häufig erleben. Du sagst dass es schon positive Reaktionen in Form von neuen Fernsehformaten gegeben hat. Glückwunsch! Kannst Du uns ein paar nennen? Und werden auch die Geschichten, die erzählt werden, diskutiert? Es gibt eine fabelhafte Autorin aus dem Norden, Sally Wainwright, die SCOTT AND BAILEY für ITV geschrieben hat, wo es um zwei Polizistinnen geht, die in ihren 40ern sind. ITV hat auch die Dramaserie DOWNTON ABBEY, die ein Geschlechtergleichgewicht bei den Rollen hat, die von der Spülhilfe bis zur Gräfinwitwe. 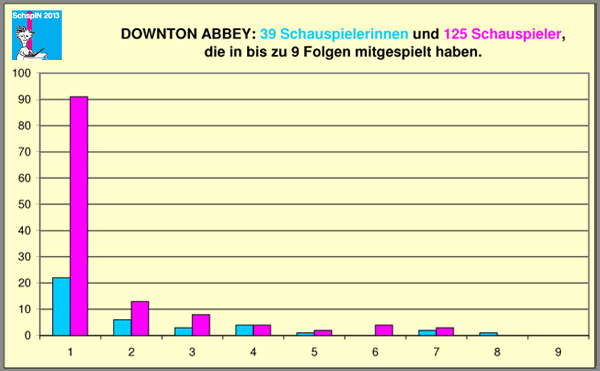 Hier ein Blick auf die Besetzung von DOWNTON ABBEY, einer Serie, die auf dem Landsitz einer aristokratischen Familie zu Beginn des 20. Jahrhunderts in Yorkshire spielt, Idee und Buch von Julian Fellowes. Die britische Erstausstrahlung war am 26. September 2010. Bis jetzt wurden 4 Staffeln mit insgesamt 34 Folgen produziert. Die Folgen der vierten Staffel, die 2013 ausgestrahlt wurden, hatten durchschnittlich 11,8 Millionen Menschen gesehen – das machte sie zu dem fiktionalen Fernsehformat mit der höchsten Einschaltquote. 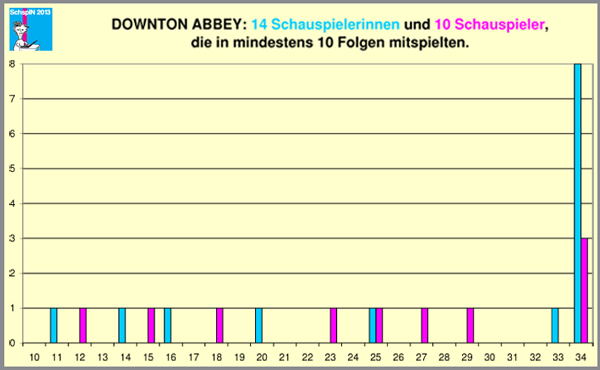 Und was gibt es noch außer DOWNTON ABBEY, Jean? 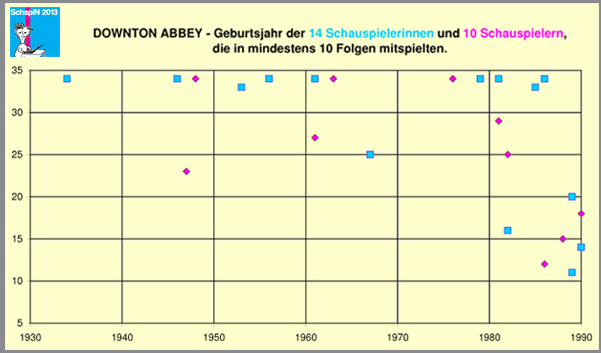 Von der BBC wurde die Serie CALL THE MIDWIFE („Ruf des Lebens“) produziert, die in den 50er Jahren spielt, mit jungen Hebammen auf Fahrrädern und älteren Nonnen. Im Moment gibt es auch noch eine sehr erfolgreiche Comedyserie die LAST TANGO IN HALIFAX heißt. Die beiden Hauptfiguren sind ein Mann und eine Frau, die schon mal in ihren Teenagerzeiten ein Paar waren, und die sich nun in ihren 70ern wieder trafen und ineinander verliebt haben. Die Serie wurde auch von Sally Wainwright geschrieben und es dauerte drei Jahre, bis sie in Auftrag gegeben wurde. Die BBC hatte sie abgelehnt mit der Begründung, dass niemand verliebte alte Menschen sehen möchte, die gleiche Begründung kam auch von ITV. Schließlich hat sich die BBC doch entschieden es zu riskieren und jetzt haben sie damit einen Riesenerfolg gelandet. Das Publikum liebt die Serie! Super! Wie sieht es mit der Filmbranche außerhalb des Vereinigten Königreichs aus? Weißt Du, ob Eure Petition in anderen Ländern übernommen wurde, als Petition oder zumindest als Referenz für eine Diskussion der eigenen Situation? Ja Kanada, wobei wir Unterschriften aus der ganzen Welt haben. I konnte u.a. über die Petition sprechen als ich an der Anhörung zum „Serving all Ages Report on TV, Radio and the Internet“ (Der Allen Altersgruppen dienen-Bericht zu Fernsehen, Radio und Internet) der BBC teilnahm, and vor kurzem auch bei der Anhörung des Ausschusses zu „Älteren Frauen in den Medien und der Öffentlichkeit“ der stellvertretenden Vorsitzenden der Labour Partei, Harriet Harman. Es ist eine Sache, über Statistiken zu sprechen, also beispielsweise die Anzahl der weiblichen und männlichen Rollen, die Qualität der Rollen ist etwas anderes. Wie sind Deine Gedanken hierzu und den Auswirkungen, die die Petition haben könnte? Die Petition und die darin geäußerten Ansichten sprechen auch Filmhandlungen an, Nackheit von Frauen, Gewalt gegen Frauen und alle Plots, die Frauen herabwürdigen anstelle ihnen positive Rollen zu geben, die die Männer eher haben. Viele dieser Punkte, die ich bei den Anhörungen vertreten habe, kamen im Namen von Equity. Du hast sicher von der Französischen Charta zur Geschlechtergerechtigkeit gehört, die natürlich sehr bahnbrechend ist, weil sie ganz deutlich auch die Frage der Qualität der Rollen, Geschlechterstereotype und gleiche Bezahlung für Frauen und Männer anspricht. Wäre das etwas, dass auf das Vereinigte Königreich übertragen werden könnte, oder sogar europaweit? Plant Equity und ihre Partner etwas in dieser Richtung? Ja, wir haben schon seit einigen Jahren bei Konferenzen und in Artikeln diese Fragen diskutiert, und das Niveau der Bücher und der Rollen wird im zweiten Projekt des FIA Hauptausschusses thematisiert: im Handbook on Engendering Change. Letzte Frage: In Deutschland haben wir weder so eine Petition, noch so eine Charta, nur das 2:1 Verhältnis und die Abnahme von älteren Frauenrollen, und die Geschlechterklischees. Gibt es irgend etwas, womit Du uns aufheitern könntest? Ich hab letztens mit meinem Sohn gesprochen, der in der Menschenrechteabteilung des Europarates arbeitet, über die Einstellung zu Geschlechtergerechtigkeit in Deutschland gesprochen und er meinte, Ihr habt eine andere Einstellung dazu, so als ob es kein Problem gibt. Siehst Du das auch so? Ich würde mal sagen, was Ihr machen solltet ist Monitoring, d.h. eine Datenerfassung der Situation, und dann immer wieder über die Ergebnisse sprechen. Zitiert das Vereinigte Königreich, die USA, Frankreich und Skandinavien usw. Ich glaube eine der schwersten Aufgaben ist Frauen dazu zu bringen, ihre eigene Situation zu erkennen. Macht das zuerst, und dann sucht Euch verständnisvolle Männer! Vielen herzlichen Dank, Jean Rogers. Nachtrag: am 6. Dezember wurde der Autorin Sally Wainwright, die Jean im Interview erwähnt hatte, der Technicolor Writing Award bei den Women in Film and Television Awards in London verliehen. 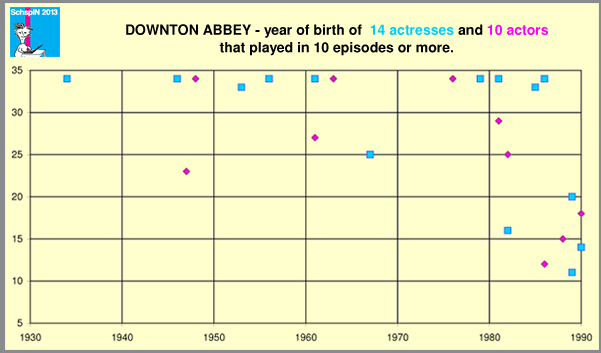 Kategorien: Analyse / Analysis, Besetzung / Cast, Fernsehen / TV, Vermischtes / Miscellaneous | Tags: Alter, Downton Abbey, Equal Representation, Equity, FIA, Frauenanteil, Gender imbalance, Geschlechterverhältnis, Jean Rogers, UK | Permanentlink.